After losing by a mere 11 votes back in 2014, Republican Lisa Krasner is running for Assembly District 26 once again. Because her challenger Jason Guinasso is also a Republican, the race will be decided in Tuesday's primary. We recently profiled Guinasso, and so now we'll be focusing on Krasner. Our News Director Michelle Billman has more. 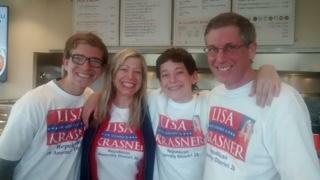 Lisa Krasner and her family on the campaign trail. Lisa Krasner teaches at Truckee Meadows Community College and says improving education is one of her top priorities. But she's not convinced that more money is the answer and wants to keep the tax burden low, especially for businesses. "We need to make sure that the money actually does go into the classroom for our children and for quality pay for quality teachers. I think most people would like to see accountability as to where those taxpayer dollars are actually going." If elected, Krasner would work to repeal the commerce tax passed last session as part of Governor Sandoval's tax package to fund education. She says that voters didn't approve of the idea when it was on the ballot in 2014. "The people feel like they spoke clearly: 'no' on a gross receipts tax. They elected Republicans, in the red wave here in Nevada, who went down to Carson City and voted 'yes' on an even bigger gross receipts tax and called it the commerce tax." Krasner has endorsements from State Controller Ron Knecht and Treasurer Dan Schwartz, both vocal opponents of the commerce tax, as well as the state GOP and the NRA. District 26 stretches from South Reno to Incline Village.